In Frogkisser! 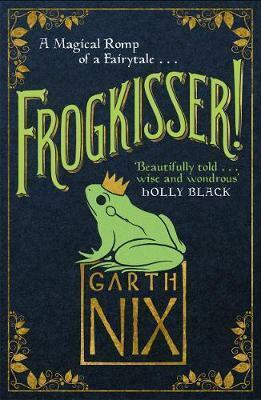 Garth Nix returns with his very own modern fairy tale, starring Princess Anya, who, with her loyal dog, must embark on a terribly important (capital Q) Quest to acquire the ingredients for a reversal lip balm, the vital item needed to change a frog back to a prince . . . oh, and save her kingdom from her villainous step(step)father. Some of my favourite things are fairytales retold and reimagined, and Frogkisser! is the perfect combination of fairytale/fantasy elements and modern diverse egalitarian sensibility, for any young reader of around 9 upwards – younger if being read to. Readers old and young who are familiar with Garth’s other work, as well as tales like The Sword in the Stone and Disney’s more modern ‘princess’ films like Tangled, Frozen or Moana, will find much to love in this bedtime story of adventure, self-discovery and friendship. The chapters are just the right length for one – or two – read aloud before bed each night. Nix is a master at rearranging the familiar aspects of fairytales to suit modern readers with more on their minds than finding a prince, getting married, and living happily ever after. Anya is the younger sister, more interested in sorcery and reading than ruling a country or falling in love. However, a promise to her sister means she’s bound to reverse a transfiguration spell put on a visiting prince, which has turned him into a frog. Of course, ideally her sister would kiss the frog but she’s no longer in love with him, so a magical lip balm will have to do. The situation isn’t helped by the fact that their step-step-father is an evil sorcerer who’s trying to take over the kingdom, and, on her quest, Anya realises that she may have more to do than to restore one prince to his proper form. The result is a really adventurous story, full of unexpected meetings and a varied cast of characters, which will appeal to boys and girls. Nix’s writing is very self-aware, but I think this will suit most readers who are used to characters on screen – at least – addressing the occasional remark directly to them. As a result, this story isn’t filled with magic and romance in the way that some fairytales are. However, we do meet many familiar types of character: witches, wizards, tree spirits, talking animals, dwarves and giants, as well as thieves (but the good kind). What’s great is that these characters are all fully rounded, they’re a diverse bunch and many of them are women. I particularly enjoyed the repeat visits of ‘Gerald the Herald’, and the Robin Hood-like good thieves, as well as the adorable Royal Dogs. I’m a fan of Nix’s books already, and Frogkisser! is no exception. This is a great book for 9+ readers, or a quick, fun, feminist fairytale for anyone a bit older than that. Thank you to Hot Key Books/Piccadilly Press for my review copy. 🙂 It’s great to hear the age you recommend books for as it’s something I struggle with. Such a great cover on this one. Next PostNext Quick podcast update!